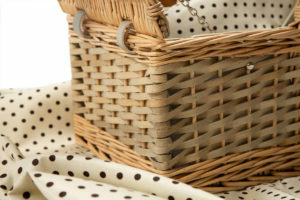 Our signature basket! 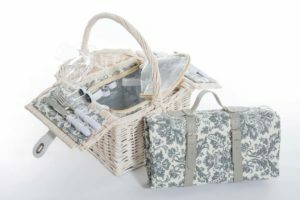 Especially designed by us for the bigger family! 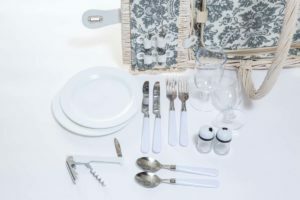 Included are 6 white plates, 6 plastic wine glasses, 6 knives and forks and spoons, 1 bottle opener, and salt and pepper shaker. 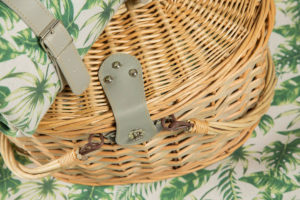 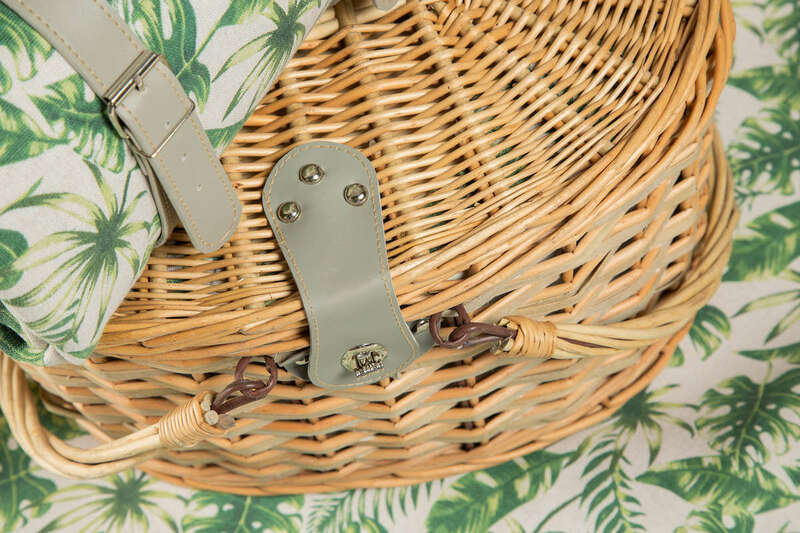 Cutlery and crockery are strapped with genuine leather straps. 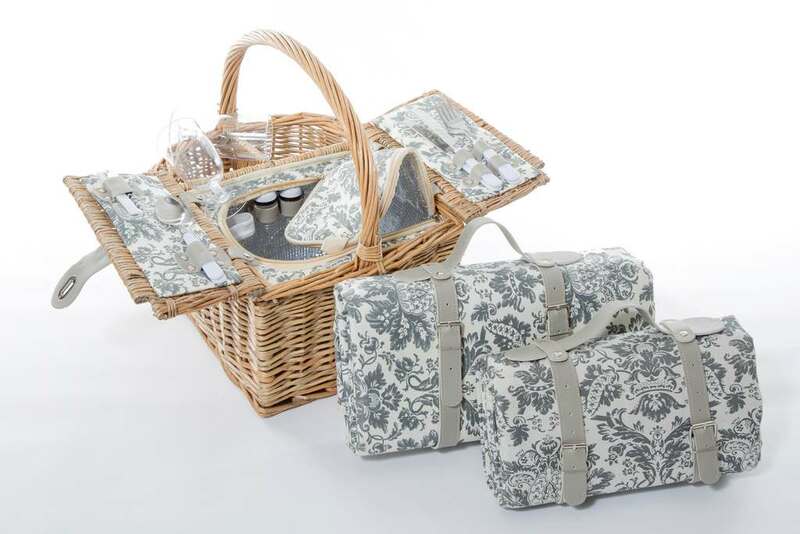 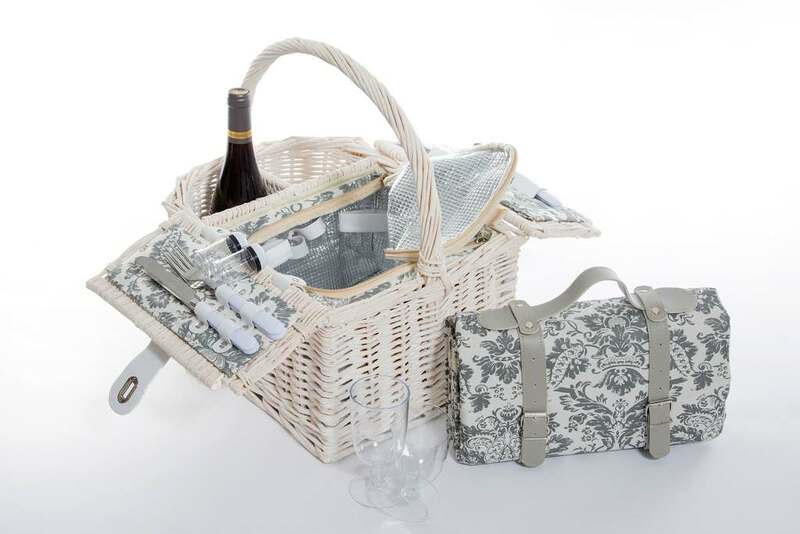 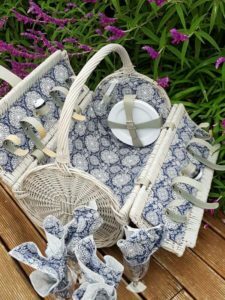 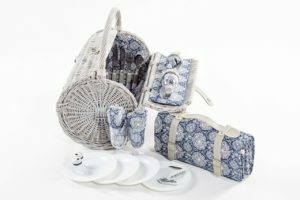 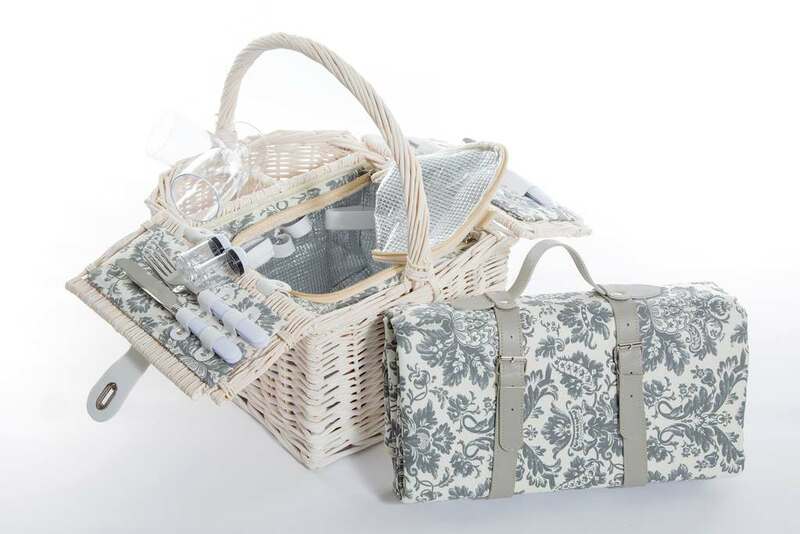 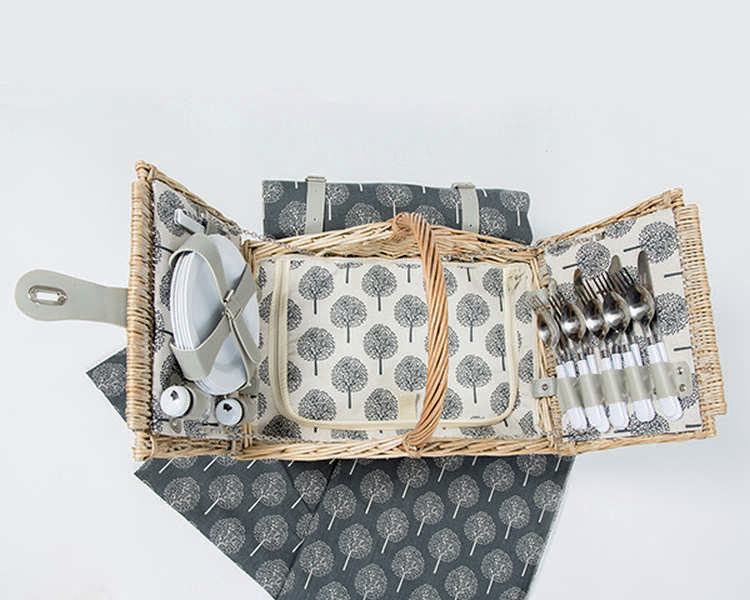 A weather proof picnic rug for this basket in the same grey fabric is optional and can be bought separately. 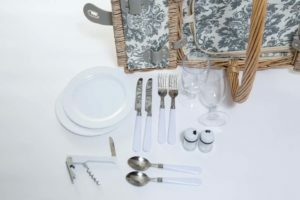 Included are 5 white melamine plates, 5 plastic wine glasses, 5 knives and forks and spoons, 1 bottle opener, and salt and pepper shaker. 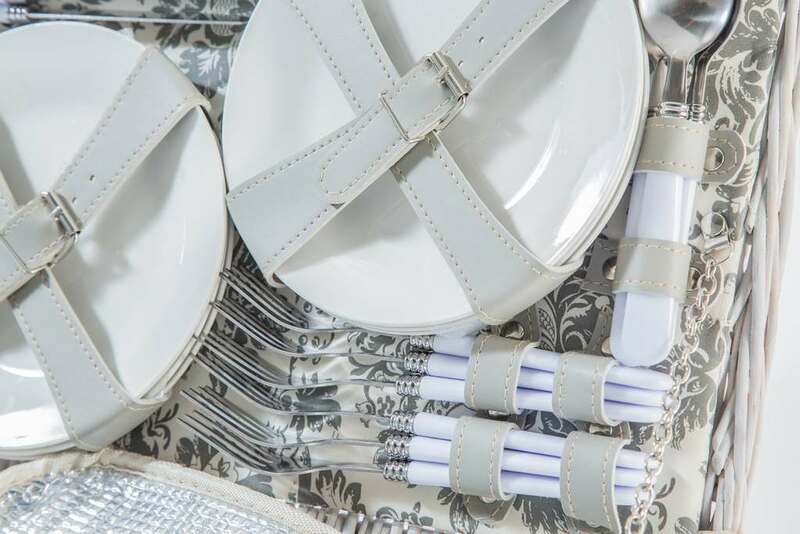 Cutlery and crockery are neatly strapped with leather-look straps. 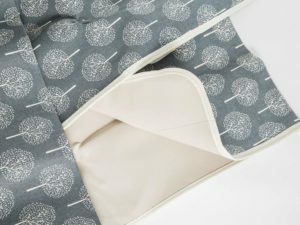 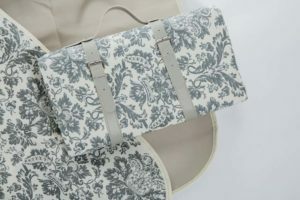 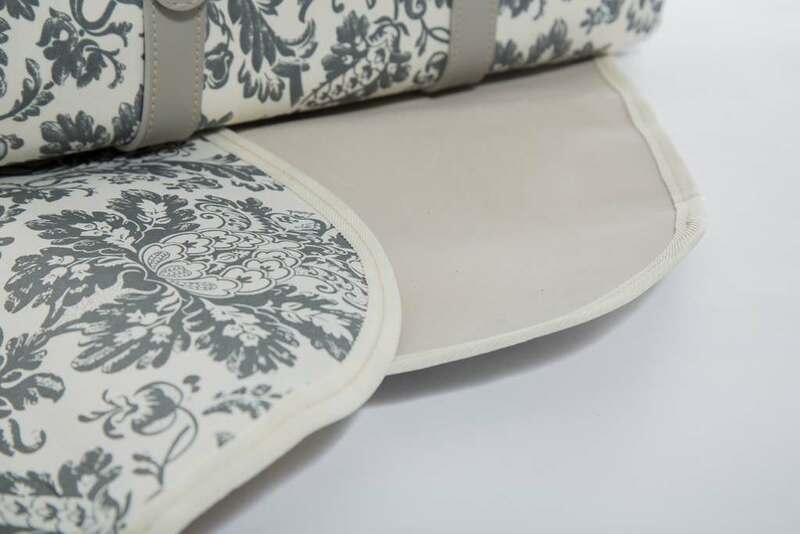 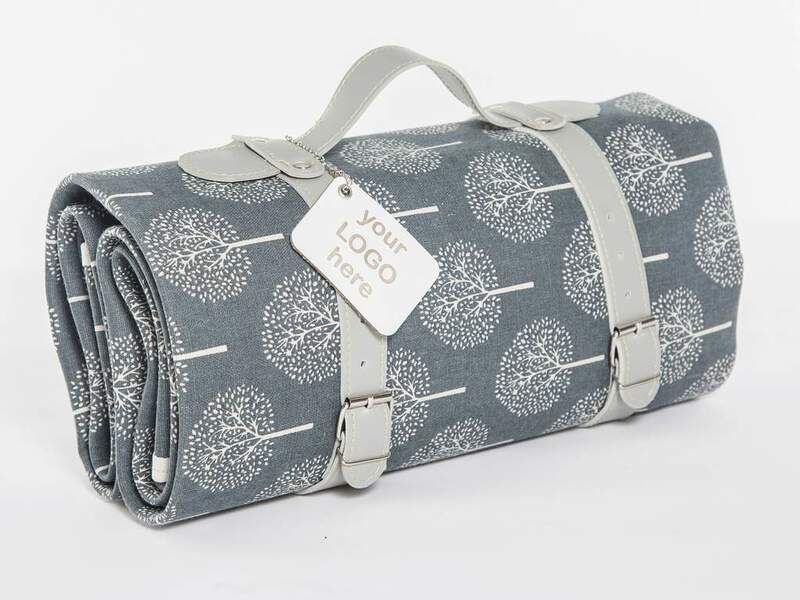 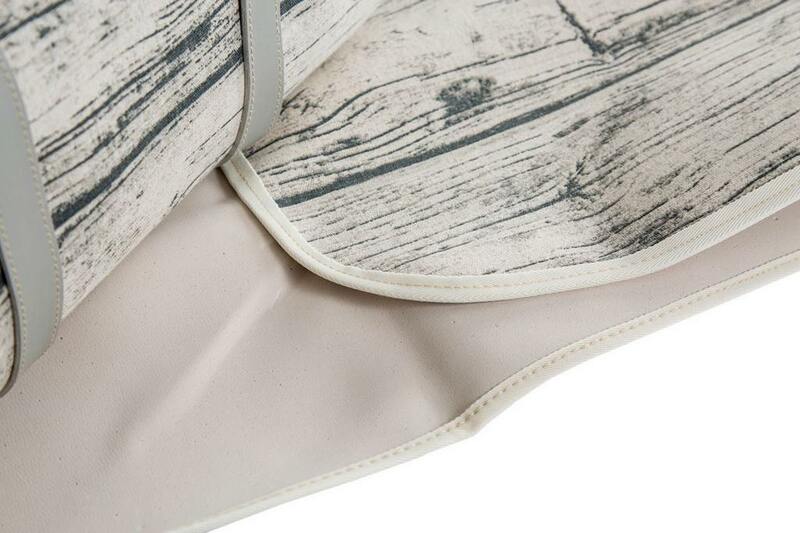 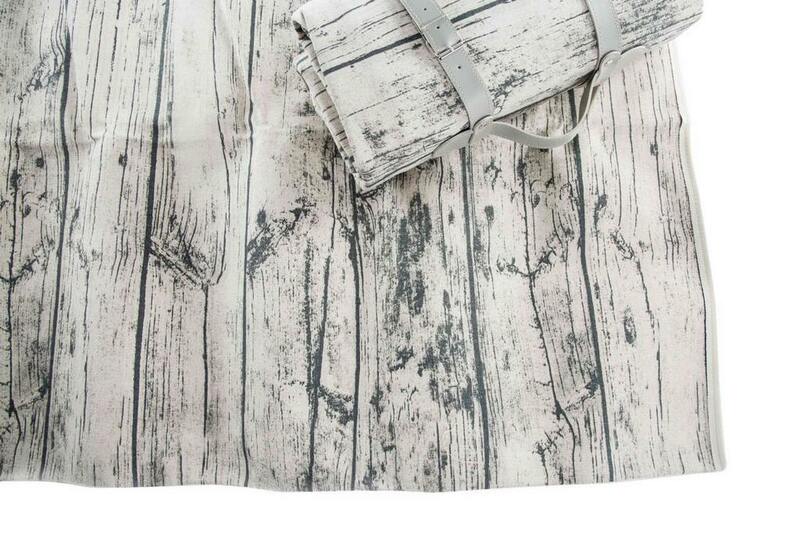 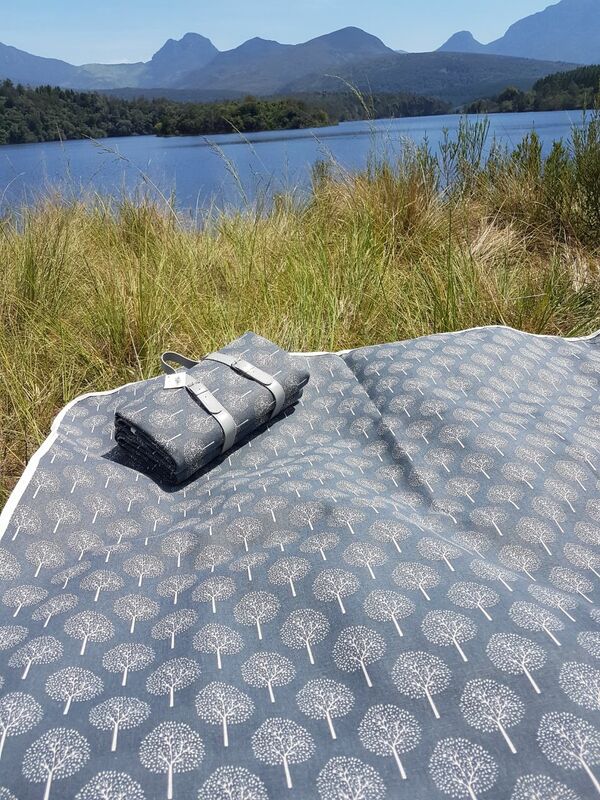 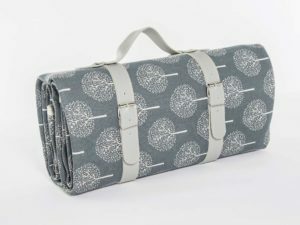 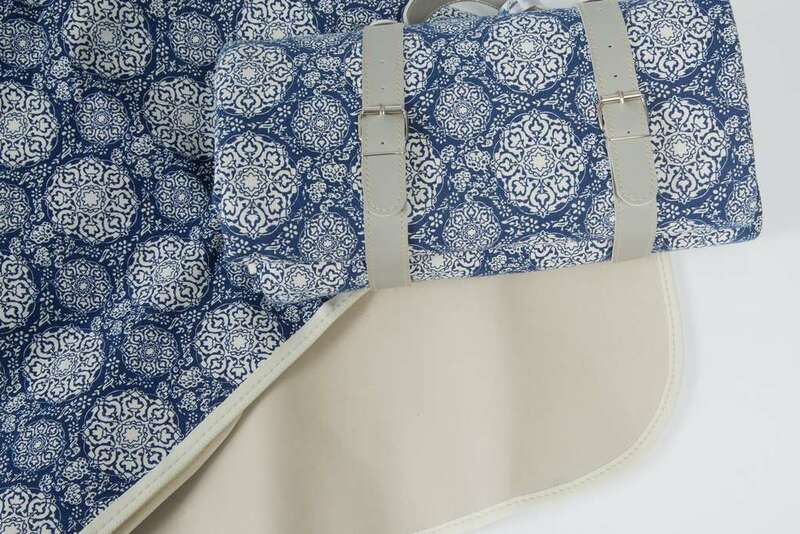 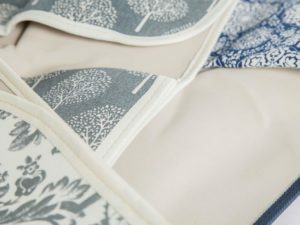 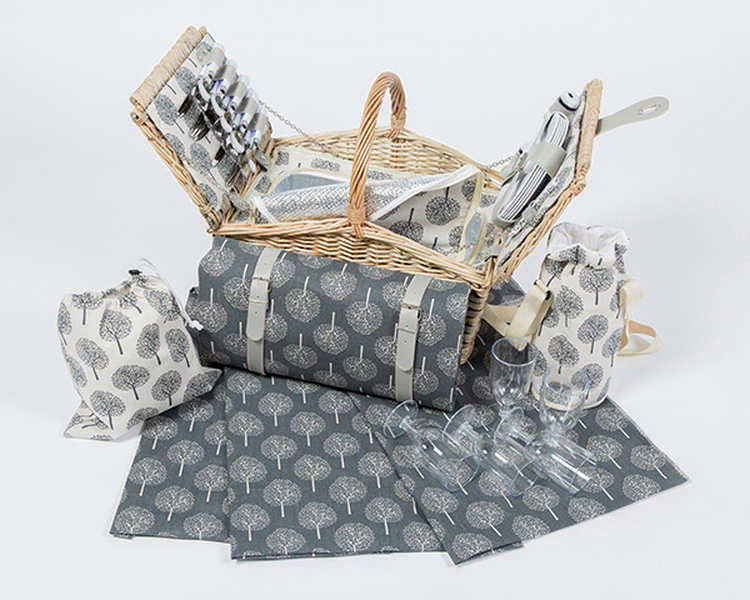 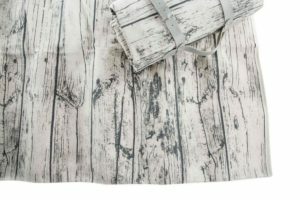 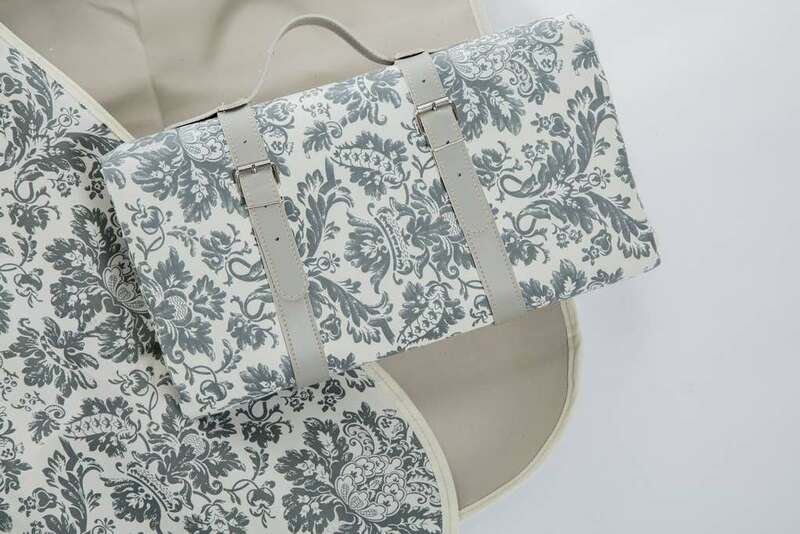 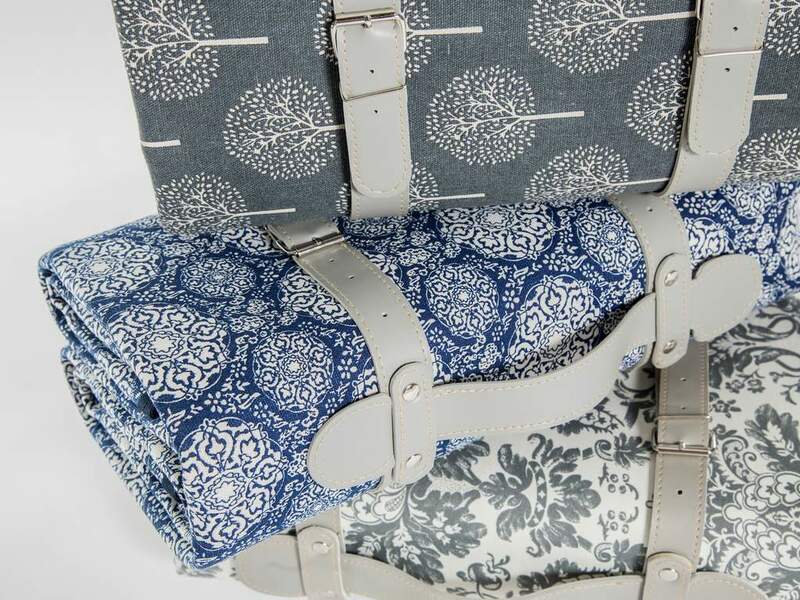 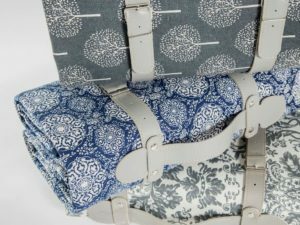 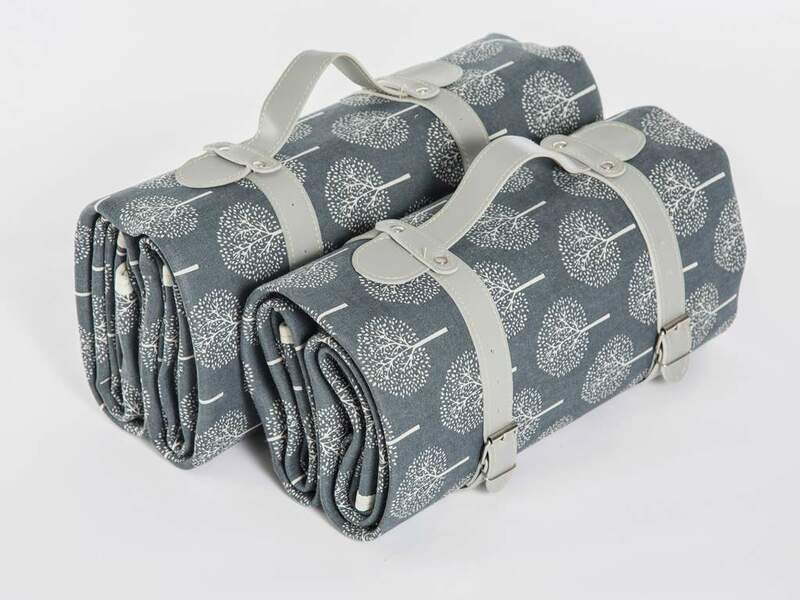 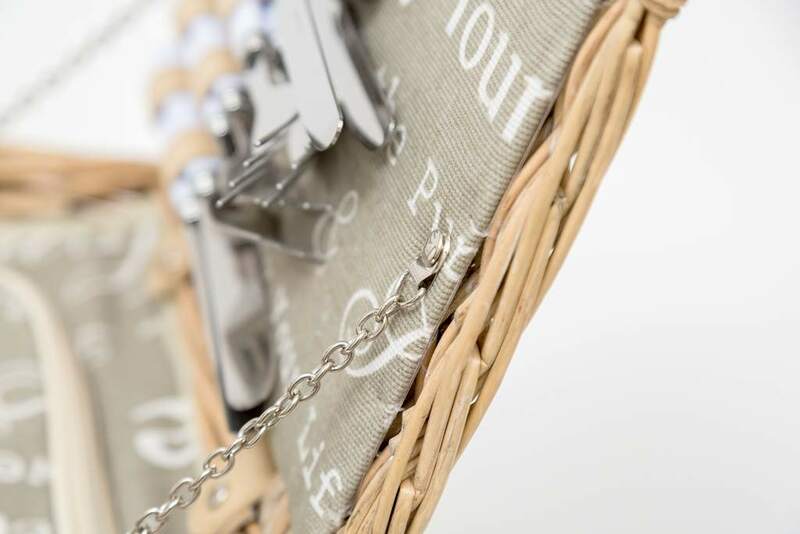 Table cloth, wine bottle bag and drawstring bag all in the same matching dark grey and cream tree design fabric. 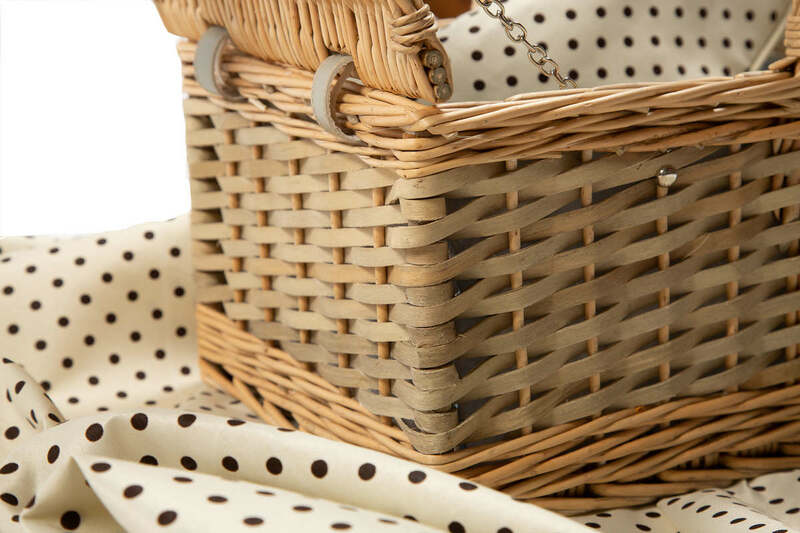 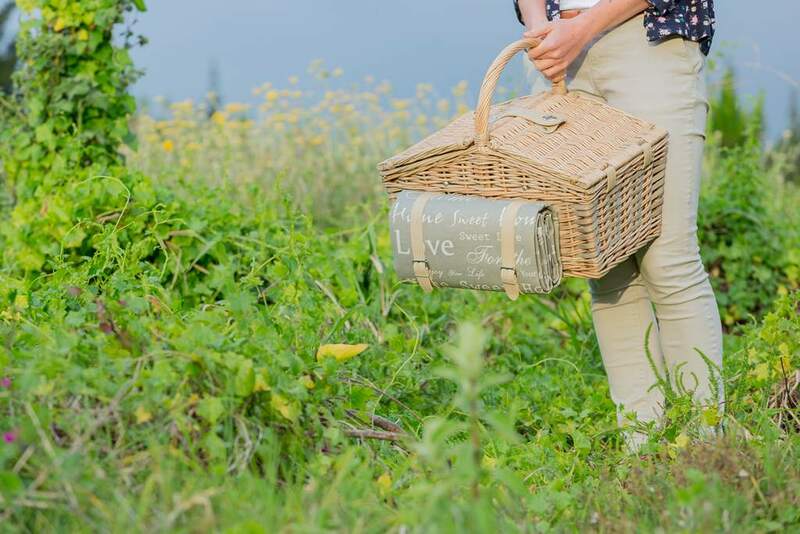 Attached to the basket is a beautiful large weather-proof picnic rug (1.8 m x 1.5 m) in the same greige fabric. 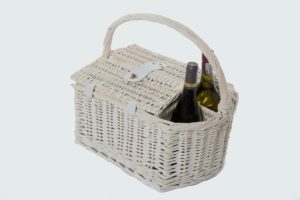 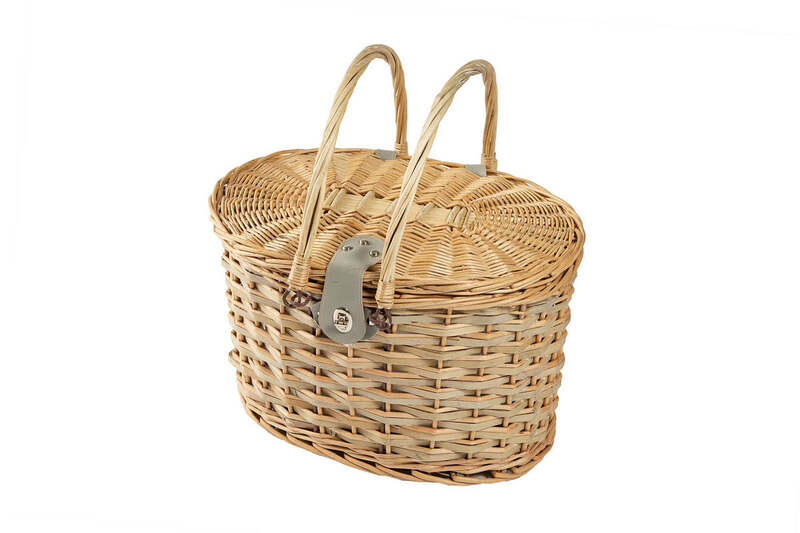 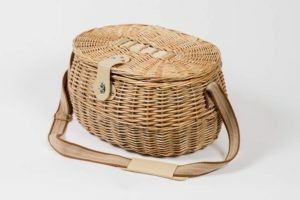 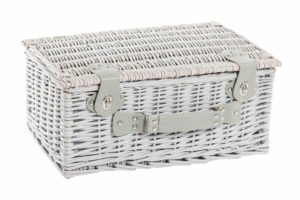 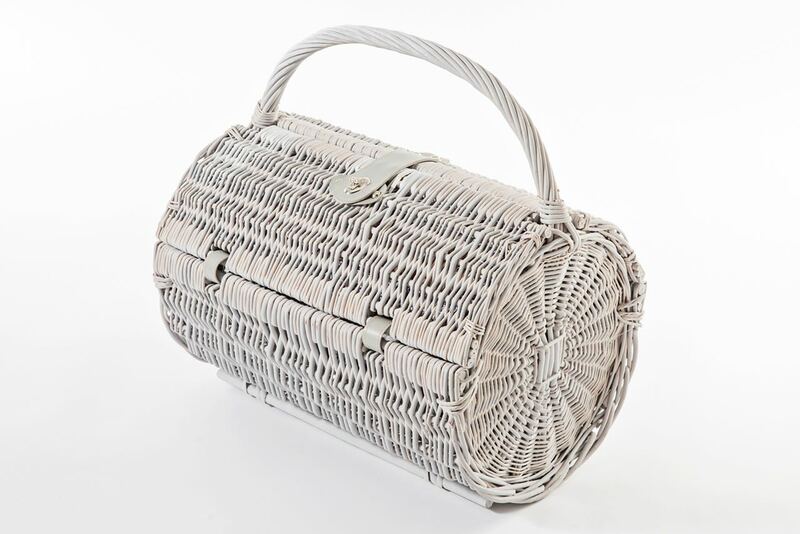 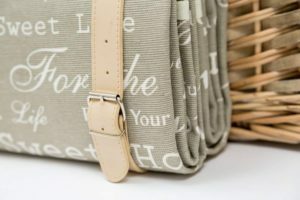 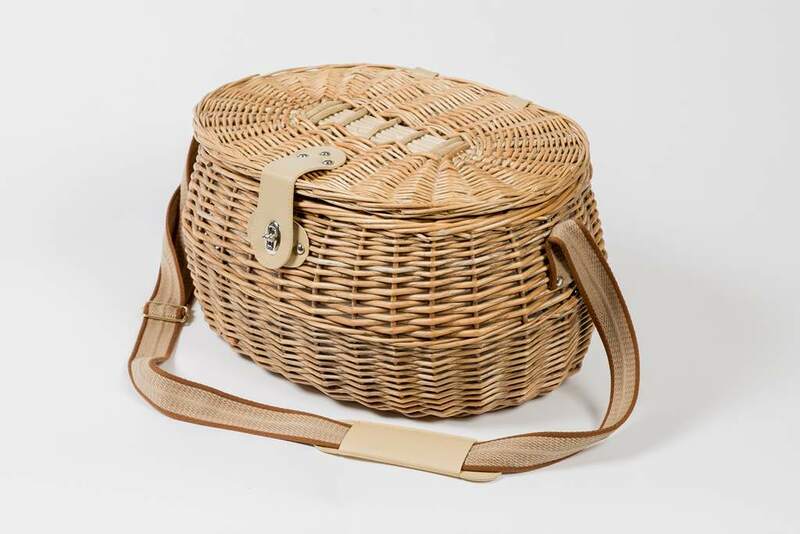 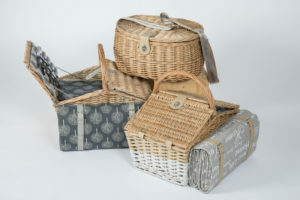 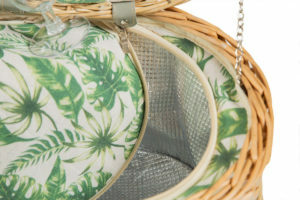 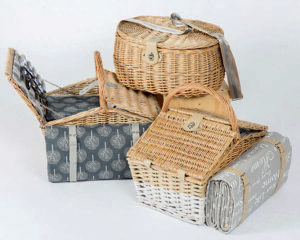 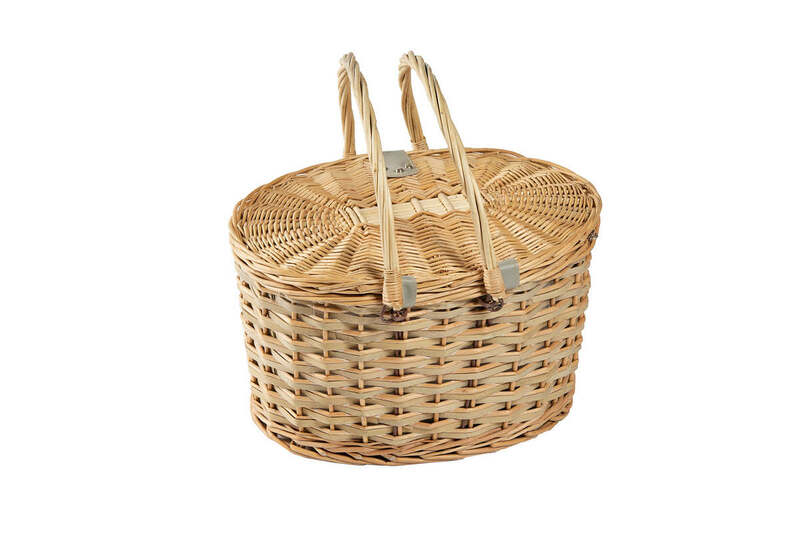 Natural wicker basket with cooler bag zip-style inside basket; lined with greige (grey/beige) colour French-style fabric. 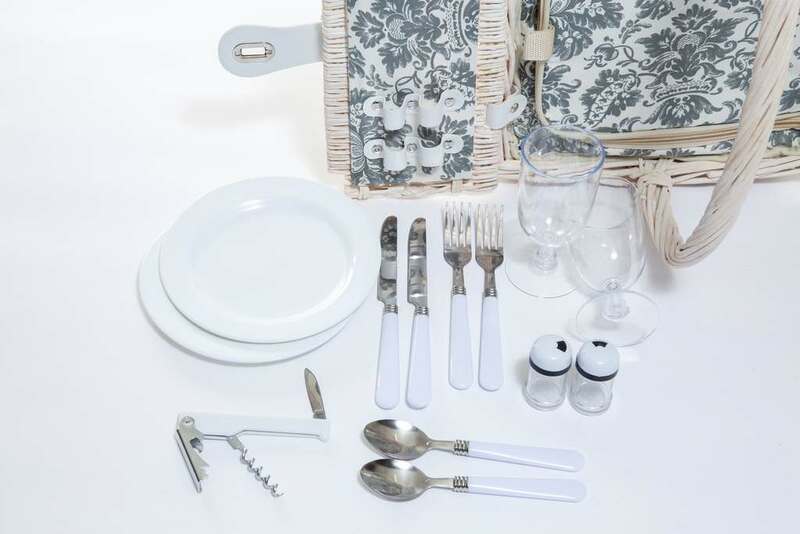 Included are 5 white melamine plates, 5 plastic wine glasses, 5 knives and forks and spoons, 1 bottle opener, and salt and pepper shaker. 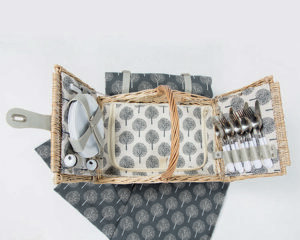 Cutlery and crockery are neatly strapped with leather-look straps. 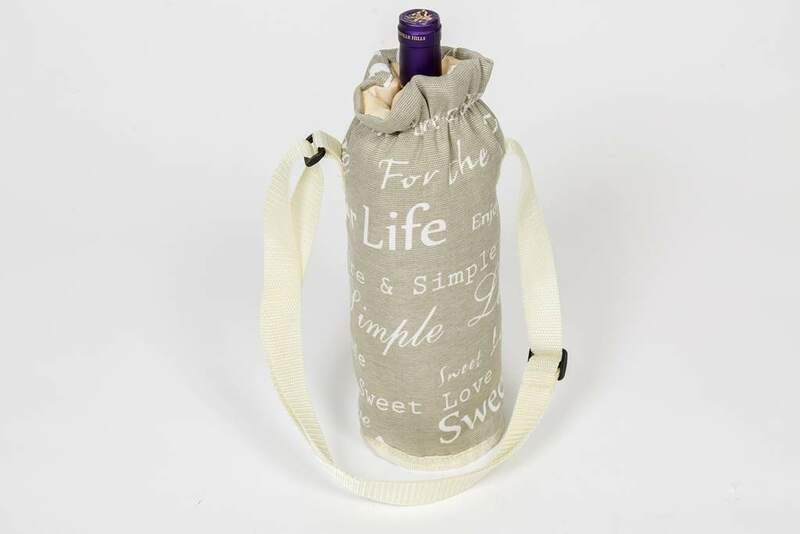 Table cloth, wine bottle bag and drawstring bag all in the same matching fabric. 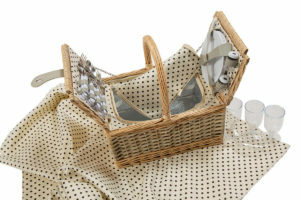 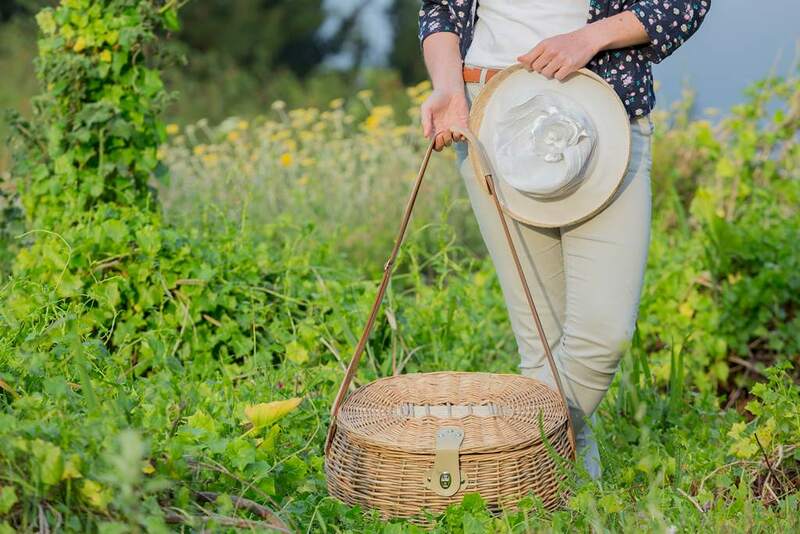 Natural wicker round basket with cooler bag zip-style inside basket; lined with cream romantic French-look fabric. 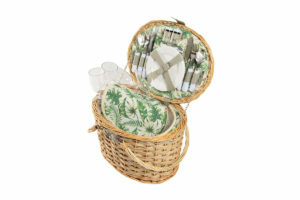 Included are 4 white melamine plates and 4 plastic wine glasses, 4 knives and forks and spoons, 1 bottle opener, and salt and pepper shaker. Cutlery and crockery are strapped with leather-look straps. 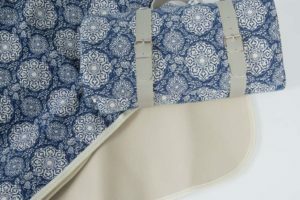 Good quality long adjustable shoulder strap to carry basket. 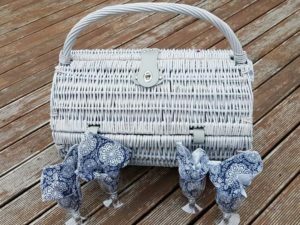 Included with this basket is a wine bottle bag in the same fabric. 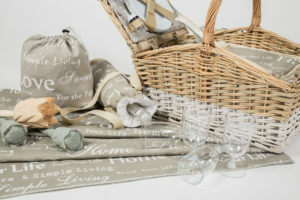 Weather-proof picnic rugs in different colours are available as an added extra and can be bought separately. 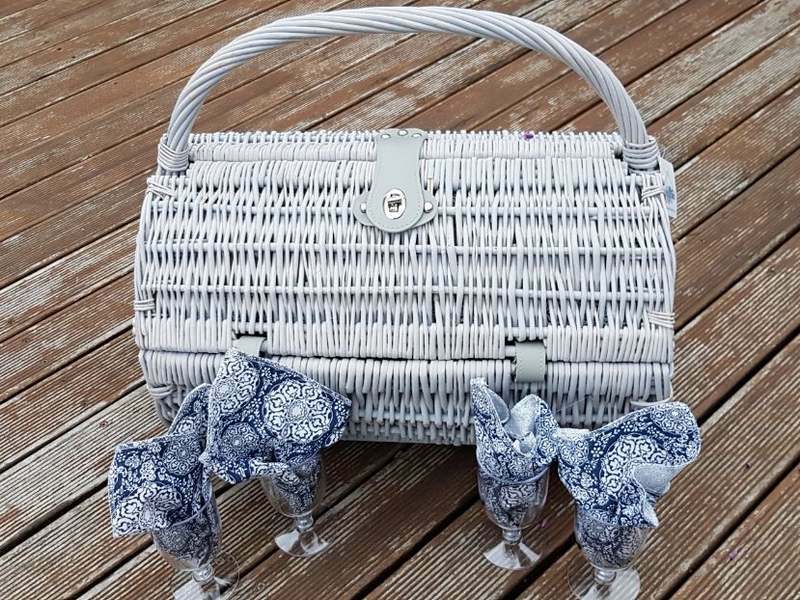 A grey-washed round large barrel basket lined with cobalt blue fabric. Included is the cutlery and crockery for 4 persons as well as a cork screw and salt and pepper containers. A cobalt blue picnic rug can be purchased as an optional extra. A lovely modern look basket equipped with cutlery and crockery for 2 persons. 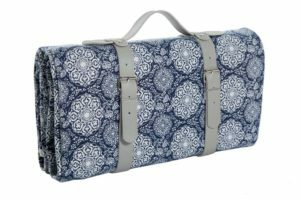 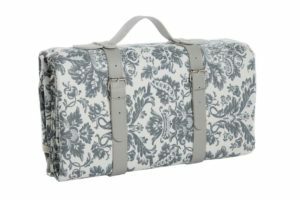 Matching picnic rug in the same grey damask fabric is available as an optional extra. 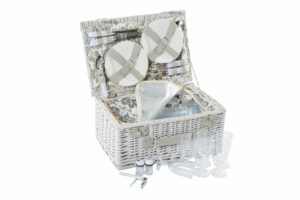 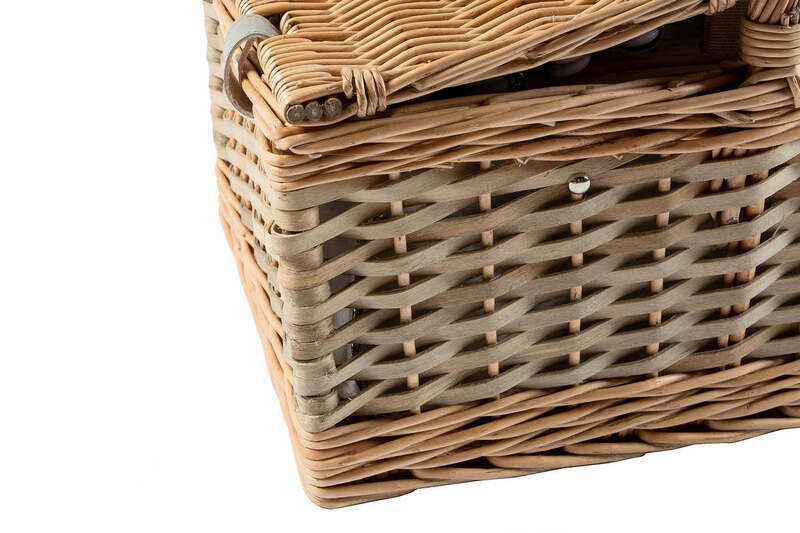 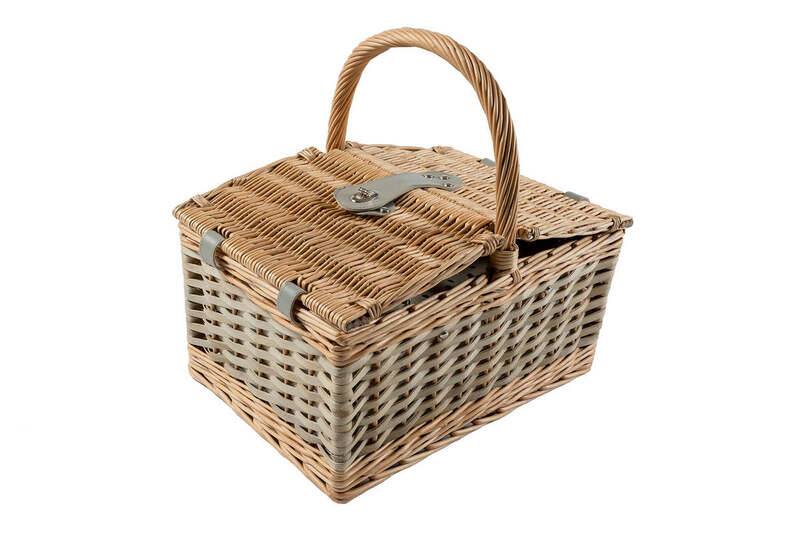 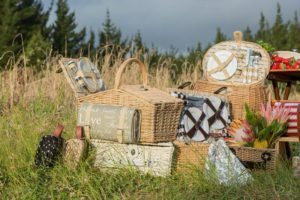 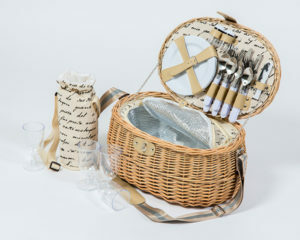 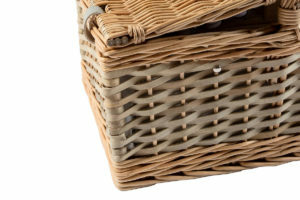 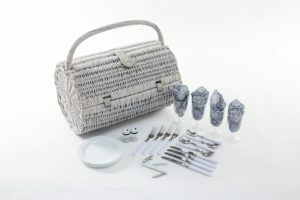 A lovely modern picnic basket for 2 persons with two openings for wine or beverages. 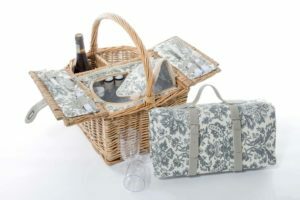 Matching picnic rug in the same grey damask fabric is available as an optional extra. 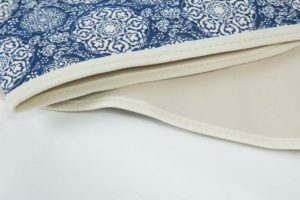 Our high quality beach/picnic rugs are made from fashionable cotton fabrics with a waterproof foam rubber backing which makes it suitable for use on the beach and on grass. 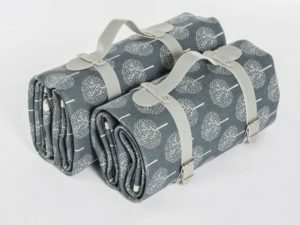 It folds up into a small compact blanket and has a handy leather-look handle which makes it easy to carry. Keep one in your motor car for whenever you need it! Also excellent as baby play mats, or gifts for men and women. 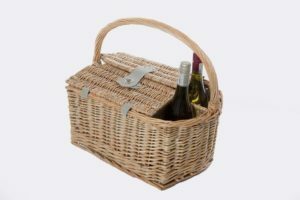 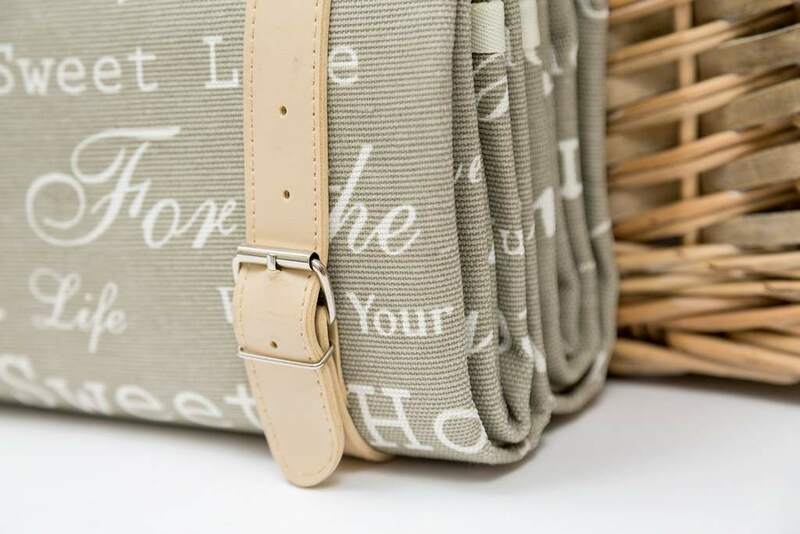 Our stylish picnic rugs are made from fashionable cotton fabrics with a waterproof foam rubber backing which makes it suitable for use on the beach and on grass. 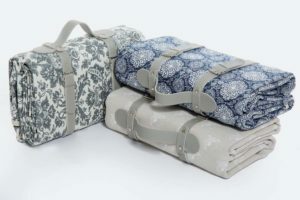 It folds up into a small compact blanket and has a handy leather-look handle which makes it easy to carry. 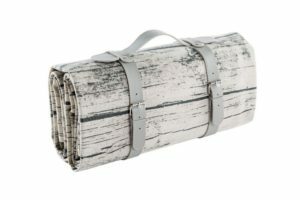 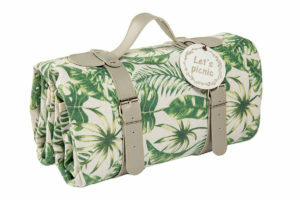 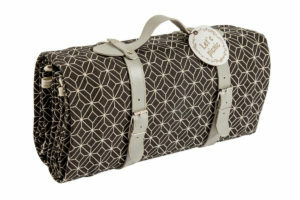 It is a versatile canvas-style picnic mat and therefore we do not call it a “blanket” but rather a picnic rug or mat. 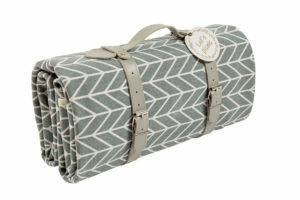 Simply roll up or fold after the picnic. 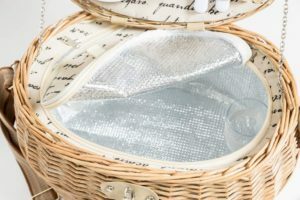 Keep one in your motor car for whenever you need it. 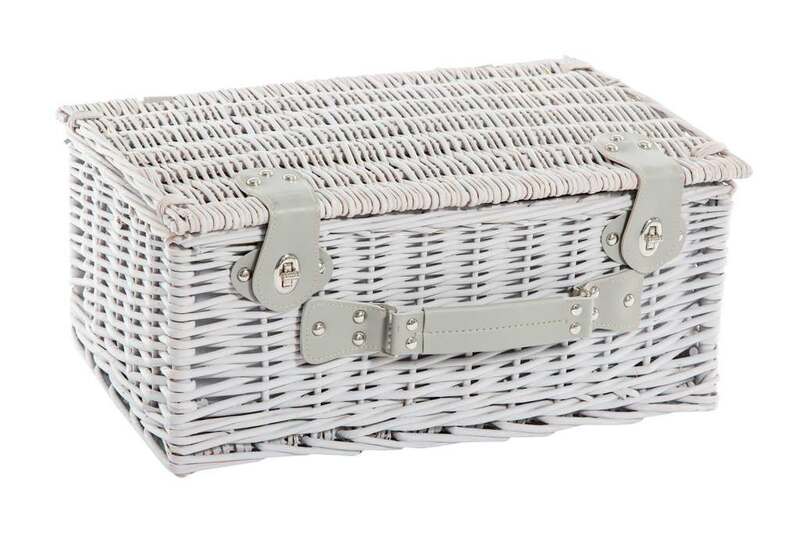 Also excellent as a gift. Let’s picnic!